The Goodyear Tire and Rubber Company was founded by Frank Seiberling in 1898. The company is named after the American engineer Charles Goodyear. Goodyear invented the vulcanization of rubber. That’s the process of hardening and stabilizing rubber to make it suitable for industrial use. Today, Goodyear has been making quality tires for nearly 120 years. They are the only tire supplier of NASCAR. And there are few things in the sky as iconic as the Goodyear blimp. Action Gator Tire is happy to offer a diverse range of Goodyear products. We have tires for all kinds of road conditions. We can outfit sedans, trucks, and more with the best tires in the industry. It doesn’t matter if you’re a commuter, a racer, or an off-road driver. We can find the right Goodyear tires for you. Passenger cars make up the majority of vehicles on the road in the United States. This classification includes a wide variety of cars. That means sedans, coupes, minivans, and a whole lot more. With so many different passenger vehicles, there are naturally a lot of tires. The tires can also depend on the driver. Let Action Gator Tire find the right Goodyear tires for your passenger car. Sport utility vehicles and light trucks are popular with all kinds of people. It doesn’t matter if you’re hauling a family or construction equipment. Trucks and SUVs are popular and practical vehicles. However you use your truck or SUV, Goodyear has a tire for you. The weather isn’t always dependable. That’s why you need a tire that is. All-season tires put together everything you need in cold and warm weather tires. Enjoy dependable performance in summer and winter months. Whether you’re dealing with heat, rain, or snow, you’ll be ready all year round with these quality Goodyear tires. Goodyear’s Assurance ComforTred has the best of all worlds for motorists. Enjoy a durable tire that provides a smooth ride for your mid-range, sedan, coupe, and more. Want a sporty look with dependable handling? The Goodyear Eagle RS-A has you covered. Enjoy the Eagle RS-A all year round, even in the snow. When you live in a warm area like Florida, it’s important to have the appropriate equipment. You need a reliable tire that features softer rubber and more grip to hold tight to the road in both wet and dry conditions. This tire can be a lifesaver for your car. The run-flat support lets drive for 50 miles at up to 50 mph with no air. 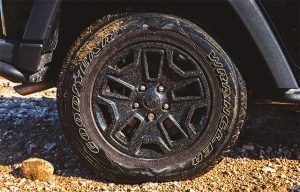 Coupled with their peerless traction on wet and dry surfaces, this tire from Goodyear is a sure thing for the summer. Some people hear the call of the open road. Others hear the call to go off. Be ready for you next adventure with all-terrain tires from Goodyear. With a variety of treads and sizes we can find the right off-road tire for your jeep, truck, SUV, or crossover. Speak to someone at Action Gator Tire to see how we can help today. These light truck tires are perfect for truck and SUV owners looking to escape to the great outdoors. The Wrangler is built to give you the same great comfort and performance on and off the road.